Pet rats tend to be friendly little creatures, although any new pet needs a period of adjustment. The exceptions are rats that have been badly treated or not handled much, and of course, wild rats. If you are new to rat keeping, you are best getting two young, well-socialized rats from a reputable breeder or animal sanctuary rather than those with a tough history. When you first bring your rats home -- it’s always best to get more than one -- place them in their new cage and give them time to settle in. The overall time frame depends very much on the personality of the rats, ranging from a few hours to a week or more. Many rats are curious and friendly immediately, coming straight over to be petted, in which case you can start stroking them right away. Don’t take them out of their cage the first day though, give them a little time. If they are a bit shyer, let them approach you and start by stroking them and letting them climb onto you, rather than grabbing hold of them. Quite often one rat will be far more confident than the other, in which case take your cue from their behavior. It might be helpful, especially when you let them out, to pick up the most confident one first and let the shyer one follow. Rats that have been abused or simply not handled very much might be far more nervous and some bite out of fear. This applies to the unfortunate rats raised as snake fodder, who may not have been handled properly at all. Far more patience is necessary with such rats and they are not suitable pets for small children. Place the cage in a quiet room and tell other family members to be quiet around it. Start by just spending time near the cage, quietly talking to the rats. Offering treats by hand may gradually boost traumatized rats' confidence, as will stroking them when they let you, but avoid picking them up unless absolutely necessary. When cleaning the cage, scoop them up gently with both hands, wearing gloves if they bite, and quickly place them in a holding container stocked with treats. It might take weeks to tame such rats, and they may never become 100 percent at ease with people. In the event that you have rescued a wild rat, perhaps from your dog or cat, do not try to tame him. 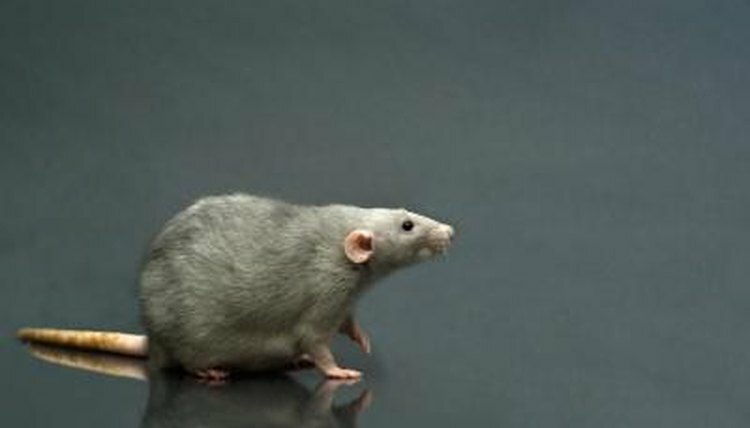 He almost certainly won’t become a very friendly or happy pet, and because rats are so sociable, he’ll be a lonely rat if you keep him. Bear in mind that wild rats often carry diseases dangerous to humans and will almost certainly bite, so try not to touch him without gloves on and always wash your hands afterwards. Contact animal services or your vet for further advice, noting that they may not be willing to help animals viewed as pests.